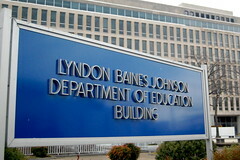 Education Resources Information Center (ERIC), sponsored by the U.S. Department of Education and Institute of Education Sciences, is a digital library of education research and information on thousands of educational topics, from 1966 to the present. It includes bibliographic information and full-text documents. ERIC combines citations from two separate indexes, one to NON-JOURNAL OR DOCUMENT publications and the other to JOURNAL publications. ERIC documents beginning with ED indicate non-journal or document publications and ERIC documents beginning with EJ indicate journal articles. You can access ERIC on the EBSCO platform through GFU libraries.